The samurai shouted joyfully and ran forward. Then the girl drew away from him, still beckoninghim with the right hand. The shuttlecock lured him, and he followed. So they went, the two of them, till they came to the house that was in the garden, and three stone steps that led up to it. Beside the lowest step there grew a plum tree in blossom, and upon the highest step there stood a fair and very young lady. She was most splendidly attired in robes of high festival. 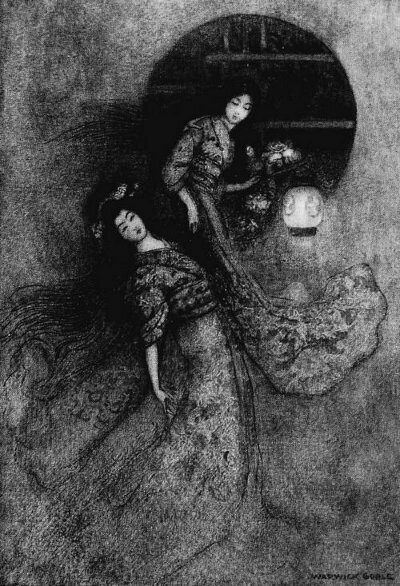 Her kimono was of water-blue silk, with sleeves of ceremony so long that they touched the ground; her under-dress was scarlet, and her great girdle of brocade was stiff and heavy with gold. In her hair were pins of gold and tortoiseshell and coral. The next day Hagiwara sat alone in his house from morning till evening. He had his hands before him; and he thought, but did nothing more. At the end of the time he said, “It is a joke that a couple of geisha have sought to play on me. Excellent, in faith, but they shall not have me!” So he dressed himself in his best and went forth to join his friends. For five or six days he was atjoustings and junketings, the gayest of the gay. His wit was ready, his spirits were wild. “The same, the very same shall be the manner of our meeting,” he said. He found the garden wild and overgrown. Moss covered the three stone steps. The plum tree that grew therefluttered its green leaves disconsolate. The house was still, its shutters were all closed, it was forlorn and deserted. Then drew near the Festival of Bon, the time of returning souls. The good folk of Yedo took lanterns and visited their graves. Bringing food and flowers, they cared for their beloved dead. Onthe thirteenth day of the seventh month, which, in the Bon, is the day of days, Hagiwara the samurai walked in his garden by night for the sake of the coolness. It was windless and dark. A cicala hidden in the heart of a pomegranate flower sang shrilly now and again. Now and again a carp leaped in the round pond. For the rest it was still, and never a leaf stirred. A little before daybreak the samurai fell into a deep sleep, and awoke to find himself alone in the clear light of the morning. He lost not an instant, but rose and went forth, and immediately made his way through Yedo to the quarter of the city which is called the Green Hill. Here he inquired for the house of the Lady of the Morning Dew, but no one could direct him. High and low he searched fruitlessly. It seemed to him that for the second time he had lost his dear lady, and heturned homewards in bitter despair. His way led him through the grounds of a certain temple, and as he went he marked two graves that were side by side. One was little and obscure, but the other was marked by a fair monument, like the tomb of some great one. Before the monument there hung a lantern with a bunch of peony flowers tied to its handle. It was such a lantern as is used at the time of Bon in the service of the dead. “‘We have moved to a little house ... a very little house ... upon the Green Hill ... we were suffered to take nothing with us there and we are grown very poor ... with grief and want my mistress is become pale....’ A little house, a dark house, yet you will make room for me, oh, my beloved, pale one of my desires. We have loved for the space of ten existences, leave me not now ... my dear.” Then he went home. Every night, for seven nights, the maidens with the peony lantern came to Hagiwara’s dwelling. Fair weather or foul was the same to them. They came at the hour of the Ox. Therewas mystic wooing. By the strong bond of illusion the living and the dead were bound together. Add The Peony Lantern to your own personal library.